Channeling Stocks patterns are a continuation patterns that slope up or down and is bound by an upper and lower trend line. The upper trend line marks resistance and the lower trend line marks support. The wider the channel pattern, the stronger the trend. The rules for confirm a valid channel pattern are the same as for drawing a valid trendline. It takes two or more price highs and lows, with three acting as true confirmation. Channel Line: The line drawn parallel to the main trend line is called the channel line. The channel line will be based off of A minimum two reaction highs or lows. Bullish Price Channel: As long as prices advance and trade within the channel, the trend is considered bullish. The first warning of a trend change occurs when prices fall short of channel line resistance. A subsequent break below main trend line support would provide further indication of a trend change. 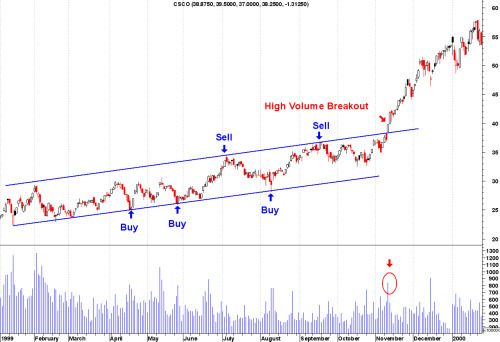 A breakout above channel line resistance with strong volume would be bullish and could mean a strong price advance. The OBV Indicator can be used to confirm the break. Bearish Price Channel: As long as prices decline and trade within the channel, the trend is considered bearish. The first warning of a trend change occurs when prices fail to reach channel line support. A subsequent break above main trend line resistance would provide further indication of a trend change. A break below channel line support with strong volume would be bearish and indicate a strong price decline. Along with using channel patterns for breakout trading, you can use this pattern for swing trading. The above chart shows the buy and sell points. Combine this with indicators such as the RSI indicator or the Stochastics indicator. Return from "Channeling Stocks" to the Home Page: "Stock Market For Beginners"